Forestburgh, New York (October 24, 2010) Enda McCormack and Bernard Farrell driving a Mitsubishi Evo 9 won the Rally New York Autumn Rallysprint 2010 yesterday. McCormack’s other recent success is the third place in the 2010 United States Rally Championship concluded at the final round at Prescott, Arizona earlier this month. Autumn Rallysprint 2010 was a short rally with 50 miles of special stages and the total length of 86 miles. 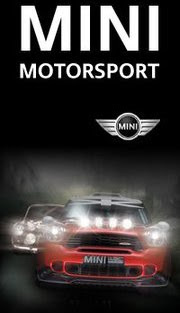 This one-day Rallysprint offers reconnaissance in the morning followed by competition that starts in late morning. A small but competent field ran a single stage two times in each direction and this was repeated again after the lunch break. The event was marked by close competition and several racing accidents, none of which resulted in any injuries, and ran on time all day. Watching rally cars blasting down the long hill followed by a high-speed turn at the Aquehonga Spectator Area was a real treat for true rally enthusiasts. 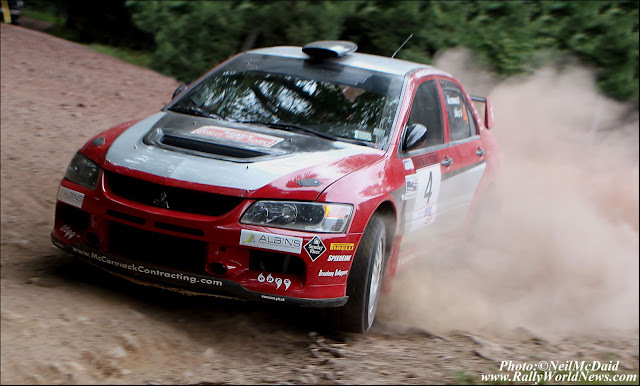 Tom Lawless, the 2010 United States Rally Champion, codriven by Alex Kihurani in another Mitsubishi Evo 9 lost his turbo on the first stage and rejoined the fight under Super Rally rules. He battled valiantly by winning five of the remaining six stages and whittling down the stage record to mere 5 minutes and 2 seconds on the last stage. This was a 45-second improvement over the previous stage record established by Seamus Burke in 2007. Without diminishing Lawless’ achievement, this large improvement was in part caused by the fact that the Mortimer Schiff road was in a better shape than ever because of the road improvement program by Rally New York, Ltd. Lawless could not overcome the Super Rally penalties and ended up fifth overall. O’Brien and McCabe in a Subaru WRX STi also broke the old stage record on the first three stages but were sidelined by an engine failure. Second place overall and the first in Two-Wheel-Drive went to Greg Healey and Aaron Crescenti after an outstanding drive in an old Datsun 280Z. Niall Johnson with Daniela Manago in a Subaru WRX achieved a big success with their third place overall and a win in Production All-Wheel-Drive with amazingly consistent stage times just over six minutes. Competition was very close with Don Kennedy and Jeremy Neyhart in a Subaru Impreza in the fourth overall rounding up the top five. The Autumn Rallysprint 2010 was the final round of the New York Rally Championship – Thunder 102 Cup, sponsored by Tearoff Guys (www.tearoffguys.com) and presented by Thunder 102 Rally Radio (www.thunder102.com). The event took place in beautiful weather on excellent roads on Ten Mile River Scout Reservation in Narrowsburg, New York and was enjoyed by all. More information about the New York Rally Championship and Rally New York events can be found at http://www.rallynewyork.com/ .